Writings based on Grisebach's travels through the Balkans and western Turkey in 1839-1840 established his reputation as a botanist and geographer, supplementing his earlier experiences elsewhere in Europe. Grisebach's work featured both taxonomic studies and floristic analyses, but it is in the latter area that he made his greatest mark. 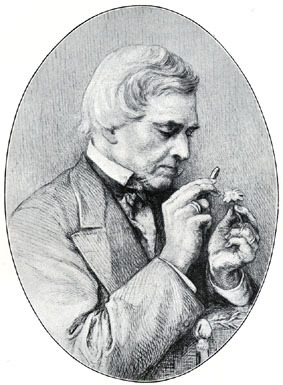 Influenced by von Humboldt's ideas on the relation of climate to floral assemblages, he coined the term "Geobotanik" (geobotany) to help describe the kinds of causal influences he imagined to be operating (which, it has been observed, tended to neglect historical forces to an unrealistic degree). His most important work was undoubtedly Die Vegetation der Erde nach Ihrer Klimatischen Anordnung, a milestone publication in the history of phytogeography. --born in Hannover, Germany, on 17 April 1814. --dies at Göttingen, Germany, on 9 May 1879. --Taxonomic Literature, Vol. 1 (1976). --Journal of the Arnold Arboretum, Vol. 46(3) (1965): 243-285.